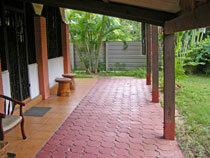 This house is located in the South – West of the island of Koh Samui, in Lipa Noi, a quiet, unspoilt area, which yet has been fairly undiscovered by mass tourism. 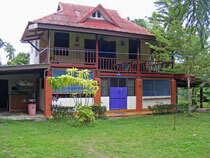 The two story house is one of all together 9 houses embedded in a lush, tropical garden. There are no loud bars, or big shopping centers in this area, but small local markets and restaurants. 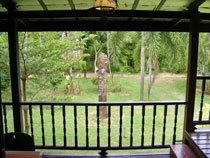 To Nathon it is a 15 minute drive and to Lamai with many shops, bars and entertainment you drive about 25 to 30 minutes. The beach in front of the resort which you have in 5 minutes walking distance, is due to a coral reef not good for swimming. But if you walk along the beach for a few minutes you have all you can expect from a beach. You enter the house through a double winged door and get into the ground floor. 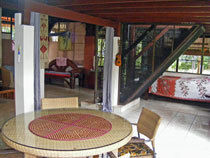 To the left is the dining area with a round table and four chairs. The adjoining kitchen area is simple and provides a counter, a one burner gas stove, microwave, sink, floor units and a shelf. A big fridge/freezer combination and pots and pans complete the kitchen. 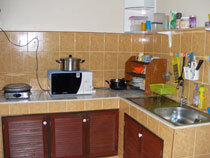 Next to the kitchen is the entrance to the bathroom with shower, wash basin toilet and washing machine. 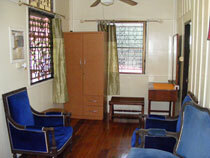 The living area is furnished with two sofas, a table, and an arm chair. There is also a sideboard and a small side table with a lamp on top. 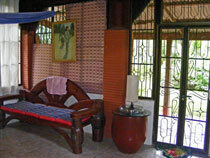 A fan generates a cooling breeze and there is a flat screen TV to keep you entertained. Depending on the season and the weather conditions the TV and internet reception is bad and slow and therefore only offered for free. From the living area a door gives way to the big, roofed terrace at the side of the house, furnished with stools and chairs. Half ways under the internal star is a queen size bed. You can separate this part of the room with curtains from the rest of the room, so that it can be used for a relaxing nap during the day or as a 3rd bedroom. Escalating the internal stair, which can be secured by a gridlock, you reach the big, roofed balcony stretching along the whole front of the house. It is furnished with a table, chairs and a long chair and you can enjoy the view onto the well kempt garden. Through a sliding door you enter the spacious corridor which can be used as a second living area and provides a sofa, two armchairs, a wardrobe and a dressing table. A ceiling fan cools the area. 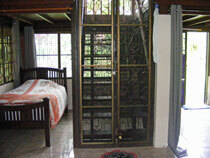 From here you have access to the bathroom with a shower, wash basin and toilet as well as to the two bedrooms. A step leads up to the slightly elevated, small bedroom 1, providing enough room for a double bed, a small bedside table with a lamp, and a small wardrobe. An air conditioning and an oscillating ceiling fan keep the temperature at a convenient level. Bedroom 2 also is also rather small but very cozy. 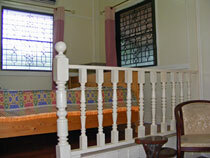 Here the double bed is situated on a gallery with a railing. There are also a small chest of drawers and a sideboard that can be used as a desk, and a fan and an air conditioning keep the temperature low. The quality of the satellite and internet signal varies with the season therefore this service is offered gratis.